Bonus: Slow Cooker Mexican Style Honey Lime Chicken is a super duper easy dump it in the crockpot and come back to slow-simmered deliciousness recipe. 10 minutes, people, to toss this together. It’s almost too good to be true. Seriously, you’re just gonna toss a few things in the slow cooker cook it for several hours on low or a few more on high and come back to shred that chicken to a luscious tangle in its very own bath of flavor, add in the tart lime, maybe some cilantro if you’re feelin’ fancy and serve with all your most favoritest Mexican accompaniments. So that’s it folks, minutes to make. Almost embarrassingly easy. And you’ll be rewarded with mounds of luscious chicken for tacos and enough leftovers (if you can stop eating and don’t devour every luscious morsel) for enchiladas, tacquitos, tostadas or whatever strikes your fancy later in the week. You’re going to feel like you are on vacation. It’s fresh and bright and seriously delish. Umm…waiter, where’s my Margarita? Slow Cooker Mexican Style Honey Lime Chicken relies on some of your favorite Salsa for the flavor, so maybe you want it green or maybe you want it red? Just use Salsa Verde or your fave tomato salsa. Pick a good salsa for this recipe, one that you love, and it will make all the difference. There’s only a handful of ingredients in Slow Cooker Mexican Style Chicken, but I get that sometimes time is of the essence. Some easy options, for when you hardly have a minute to get this in the crockpot: Don’t feel like chopping an onion or mincing garlic? Just use some powder. Same with the Chipotle. Go with maybe a teaspoon of onion powder, 1/4 teaspoon of garlic and 1/2 a teaspoon of Chipotle powder. Or maybe you’d rather just skip the onion and garlic and all the spices and make this super duper extra fast? Use a taco or fajita seasoning packet, add the squirt of honey and your salsa, put on the lid and call it a day. This really is a super easy recipe to customize, so make it your own. If Chipotle scares you or maybe you’re serving to littles, tone it down and use a little every day chili powder. A few shopping hints: Always look for chicken on sale; it usually drops to a low once a quarter so it pays to buy it cheap & freeze. Put the extra chipotle peppers in a Ziploc and freeze. It’s easy to break off one or two – zap the package in the microwave for a few seconds if it’s rock solid. Honey is often on sale with coupons at your drug store, and when your fave salsa is on sale, think Cinco de Mayo or Superbowl, stock up. I always think tostadas or tacos when I make recipes like this because it makes that main protein stretch much further than loading up a big-honkin’ burrito (goodness help me I love those, too, though!) Serving meals like this with lots of sides, too, helps to stretch it. Think Restaurant Style Mexican Rice, or maybe Arroz Verde Mexican Green Rice and even that old standby, Cilantro Lime Rice might hit the spot. And you can never go wrong with quick doctored up Canned Refried Beans that taste like they came straight from your fave hole in the wall, or if you plan ahead, Spicy Pintos. If you’re going fresh, some Mexican Style Slaw can never be wrong! You can see I used some of my Pickled Red Onions on these tostadas. If you’re looking to cook for today and want a leg up on dinner for another night, Slow Cooker Mexican Style Honey Lime Chicken freezes very well. Serve half and freeze half. Place chicken breasts or thighs in the bottom of the slow cooker. Top with onion, garlic, honey, chipotle, smoked paprika, oregano, cumin, salt, pepper, salsa, and green chiles, if using. Take a fork and mix everything around just a bit on top of the chicken. No need to be perfect. Cover and cook on high for 3-4 hours or on low for 6-7 hours or until chicken is tender enough to shred. Shred chicken in the slow cooker or remove it, shred it and add it back in. Add the lime, toss together and let it sit on low, covered, for about 20 minutes. Taste and adjust any seasoning: more salt, honey, more lime, hot sauce if desired. Optional: If desired, chicken breasts, which are very lean, can be rubbed with a tablespoon or two of olive oil before placing in the slow cooker to help keep them moist. I’ll be bringing this recipe to Fiesta Friday, hosted this week by Anugya @ Indian Curry Shack and Margy @ La Petite Casserole. If you haven’t clicked over to Fiesta Friday and looked over the weekly post, you’re missing out! I’m excited to say this recipe was featured on Fiesta Friday! 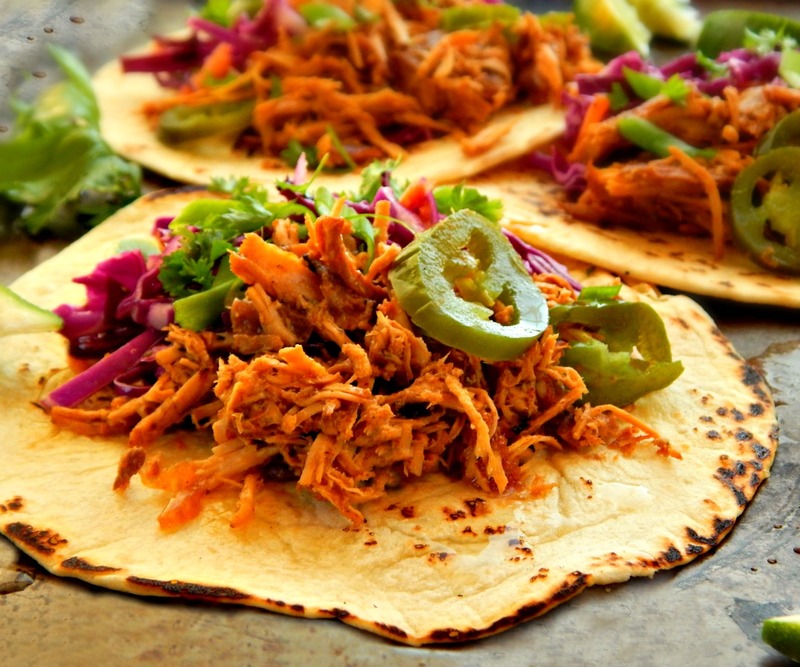 This entry was posted in Click here for Bargain Meals, Click here for Fabulous Food Posts and tagged Bargain Meal of the Week, Chicken, Chicken Breast, Chicken Thighs, Chipotle, Freezes Well, Honey, Hot Peppers, Lime, Mexican or Southwestern, Salsa, Slow Cooker. Bookmark the permalink. Another great recipe Mollie! When you open a restaurant, I’ll be waiting outside! How did you get the FF featured badge? Thank you for featuring this chicken on FF!! Oh my gosh, Elaine, anything with chipotle does it for me. Do you have the Chipotle in adobo sauce there? Where would we be without our slow cookers (I have only 5) ? Great recipe! Oh my~You win the record, I think! 🙂 I DO have to use mine more!! Simple and delicious! Thanks again for sharing! Lol, Angie!! I gave away my fondue set, too tired of storing it for that rare occasion. Now I wish I hadn’t!! I have a problem, too. Too many appliances by far. But I LOVE them. I LOVE them!! I am LUSTING over an Instant Pot. And I already have a slow cooker and a mini slow cooker and two pressure cookers. One for cooking one for canning. What can I say. We’ll start a support group???? I also have a sous vide machine that I’ve used only once. We do need a support group! But now I’m convinced I also need an instant pot! I never think to slow cook chicken. This looks delicious! It’s so stupid simple! 🙂 Perfect for tax time? Whoa Mollie! my mouth was watering just reading your list of ingredients! We eat something wrapped up in a tortilla a couple times a week around here. I’m definitely trying this!! I’ll let you know how it comes out… hugs! I’ll let you know when I make it!! thanks! I say the same thing. My slow cooker is underutilized, but always appreciated. I need to get it out more! This looks delicious! My pleasure Antonia! This is a keeper! This looks so amazing! And colorful! You’ll have to let me know how you like it! 🙂 When I used up the last of the leftovers, I added a little oil to a skillet and tossed in the chicken and it got all soft and warm and slightly caramelized in spots…oh my!! Wow, I am definitely making these. Love Mexican and these flavours are amazing. I can almost taste it already! I probably use my crockpot more than I care to admit Mollie, lol! I know! Same here with your recipes! I’m still lusting for your Guisado! I just forget to use it – and when I’m at home I use my enamel cast iron a LOT. I love it! But I’m retired so I don’t mind having something in the oven for a few hours. Now I’m getting used to using the crock pot more at the folks coz we have a lot of afternoon appointments and it’s so nice to throw something in and come home to dinner!! I am lusting after an instant pot! Me, too!! But I still want an instant pot!! Well, I hope you like this recipe then as much as we did! 🙂 And thanks!! I am with you, I don’t use my slow cooker nearly often enough. This looks delicious and super easy. Plenty to go around, Jess! 🙂 This freezes great, too.